The microgrid may be getting all of the attention, but its smaller knockoff — the nanogrid — is starting to capture the spotlight too. What is a nanogrid? Like the microgrid, it is a technology in search of a clear definition. But basically it is a small microgrid, typically serving a single customer or facility. A distributed energy resource (DER), a nanogrid can stand on its own or be part of a central grid. Nanogrids keep the lights on for their customers during a grid outage. For those not served by a grid, a nanogrid can act as a sole source of electricity. Configure a nanogrid with solar plus energy storage and this technology becomes a hot ticket. 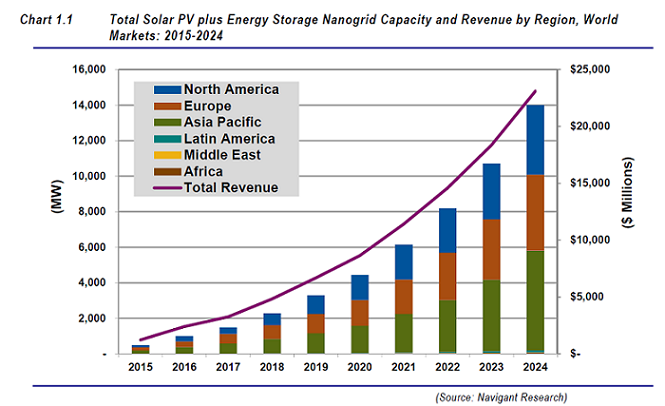 Navigant Research pegs revenue of solar plus storage nanogrids at $1.2 billion in 2015, growing to $23.1 billion in 2024. Navigant forecasts North America being a big player over the next decade, with 80 percent of the growth for commercial solar plus storage nanogrids. The market is expanding in Europe and the Asia-Pacific too. Europe is the biggest nanogrid user today and is expected to grow its market 41.7 percent (compounded annual growth rate) by 2024, a rise from 184.4 MW this year to 4,272.1 MW by 2024, according to Navigant. The solar plus storage nanogrid forecast is even healthier in the Asia-Pacific, where Navigant envisions 5,619.9 MW added in 2024, a 46.3 percent CAGR. On a country basis, Asmus says to watch Australia, Germany, Japan and the U.S.
Tesla is helping nanogrids with its high visibility play into solar plus storage. “Will this market live up the hype that has been generated due to the entry of companies such as Tesla? Probably not, but trends on DER suggest that this specific type of nanogrid is part of a much larger transformation of the grid,” said Asmus, a principal research analyst at Navigant. What might get in the way of nanogrid growth? A more interesting question might be, what won’t get in the way. Conventional solar may be nervous about the diminishing investment tax credit in the U.S. But that could help solar plus storage nanogrids, according to Asmus. So to0 could the utility opposition that is arising to net metering. Here’s why. Extracting the maximum value from solar will require coupling it with energy storage. When the two are paired, they can boost resiliency and reliability and may help reduce utility demand charges paid by consumers, according to Navigant. Nanogrids also can be installed quickly without regulatory hassle or a need to reform energy policy. “The pairing of solar PV with energy storage in a distributed fashion will soon emerge as the most economical way to successfully incorporate DER into today’s market landscape,” Asmus said. Watch especially for growth in the most radical interpretation of solar plus storage — the residential nanogrid. “This is also the application where the nanogrid model is likely to meet intense opposition from incumbent utilities, but which is forecast to show the largest growth over the next decade,” Asmus said. In general, nanogrids face more basic challenges than does microgrids, according to Asmus. Who are the big players so far? Not surprisingly Tesla and SolarCity are on Navigant’s list, along with SunPower, Sunrun, Gildemeister, LG Chemical, DC System Pioneers, E3/DC, Green Charge Networks, Ideal Power, Sunverge, TimberRock Energy Solutions and PowerStream. An executive summary of the Navigant Research report is here. 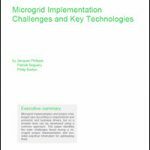 Track growth in solar plus storage nanogrids by subscribing to the Microgrid Knowledge newsletter. It’s free. 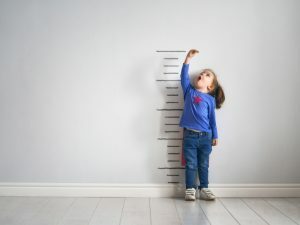 How Fast is the Microgrid Market Growing, Really? Guess Which North American Microgrid Market is Growing Fastest?